The Senator Typhoon MH630 as reviewed in the February issue definitely meant business for the keen fisho who wanted a tough boat. 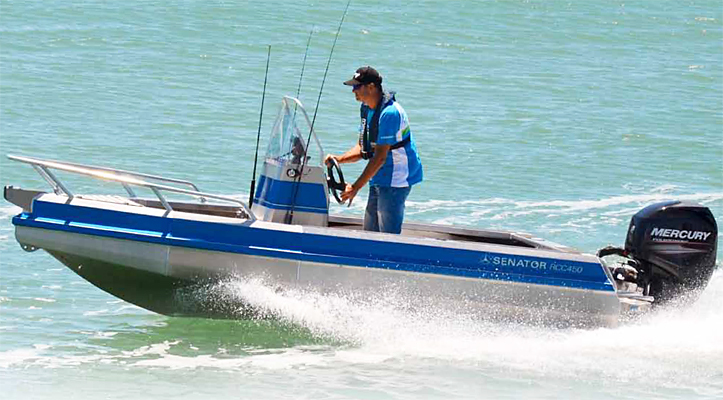 So we were interested to see how Senator’s third- smallest boat, the RCC450 Centre Console would handle. There are five models available in its centre console range. The RCC450 is recommended for a 40-60hp engine. Our test boat had a new 60hp Mercury four-stroke which looked rather large for the size of boat. It definitely got a lot of interest from other fishermen at the Westhaven Marina boat ramp who noticed the size of its motor. The little boat’s striking blue decals also helped attract such attention. With a smaller boat it is essential to have uncluttered space to fish from and having good storage for your tackle and rods is vital. This boat was stacked with great rod holders, with six on the sides and rear and another six beside the centre console. The layout was also impressive with plenty of room for three anglers to fish from comfortably. The seats could conveniently lock into the sides, with a large storage locker in the centre console and two handy drink holders. It had a large anchor well with a lid and a good storage shelf running around the sides and rear. The boat definitely looked like it was built to fish from.